I was chatting with a dear old friend yesterday, and he pointed out that he could feel I was "in resistance mode." In life coaching terms, it means that I am going against whatever good that flows. I do get my moments. Sometimes, it's whole stretches of time. I could beat myself up over the time I've wasted--and I would too--but I need to shift, pronto. Perhaps it's because I've turned 40. I'd never been one of those women who felt the need to hide their age. I thought I'd never really care about growing older--I know so many women 40 and above who just got even more amazing as they put on the years--and to some extent, I still don't, but I'm suddenly hit by this existential anxiety. I keep wondering: Am I doing what I was meant to do? What verse do I contribute to this powerful play? Is there a point to all this? And if there isn't, why do I feel like I need to contribute nevertheless? I still have no answers. But I don't want to overthink it anymore. The other day, I went out to our small garden, overflowing with plants because of the rains, and I was reminded again that "grass does not strain to grow." 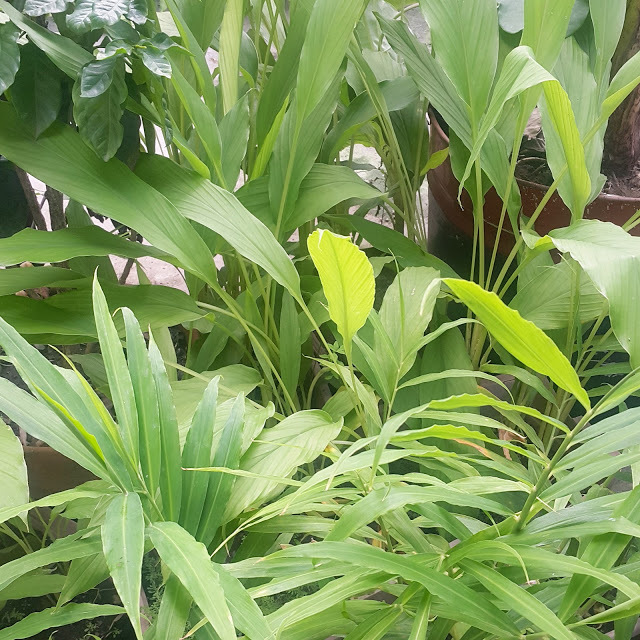 We'd planted some turmeric and ginger rhizomes a couple of months ago, and there they were, full-grown plants, bulging out of their pots. From a store-bought ginger that we planted because it had started to sprout, we now have a several ginger roots, waiting to be harvested. I planted an additional two dozen or more turmeric rhizomes. They had been our harvest from a few months ago, and they'd just stayed in a basket, almost forgotten. One day, they decided to sprout. I am not the world's best gardener, but gardening appeals to me because it reminds me all the time of how little effort--and by this, I mean resistance--there should be in what one does. If the space is right, the plant will grow. That is all there is to it. That is all I need to know. On a whim, I decided to tinker with this blog's template once again. I ended up not changing much, preferring the old look. I still think I have nothing much to say, but I consider it a sign that I came across this quote on Facebook.